In 2006 Österreichischen Post AG started a new period in the issuing of ATMs, with the acquisition of new automatic vending machines from the German company Sielaff GmbH/Co. The first two designs are by Hannes Margreiter, with 2 pretty floral themes - Tulips and Liverwort, which are printed alternately on the rolls. 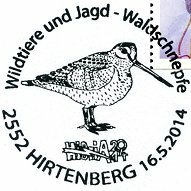 On both edges there appears to be perforations, like traditional stamps. However they are not real, just part of the design simulating a perforation! In fact the side edges are straight. 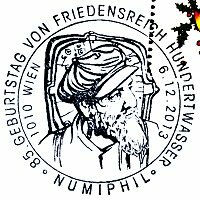 New rolls with winter and Christmas themes were used in all the Sielaff vending machines from November 24th 2006 to January 6th 2007. 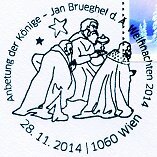 The seasonal motifs are also designed by Hannes Margreiter. The images show a winter landscape and some children playing in the snow. From January 7th 2007 all the Sielaff vending machines again used the floral themes. The rolls of labels, all with a seasonal theme, are used again from November 23rd 2007. 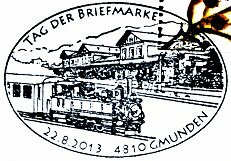 (Commemorative issue on the occasion of the exhibition dedicated to the Salzkammergut district, in the Oberösterreich or Upper Austria). 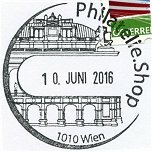 Two new commemorative designs were used in the Sielaff distributors from June 6th 2008, which were dedicated to WIPA08, the international philatelic exhibition held in Vienna in September. The new ATMs show images of the Donau City of Vienna (a view from the Reichsbrücke and a landscape from the Danube). Donau City is the new urban complex that is being built on the banks of the Danube, and which includes the Austria Center Vienna, headquarters of the exhibition. Like previous releases, the designer of the labels is Hannes Margreiter, and the manufacturer is the German company Deutsche Bundesdruckerei. 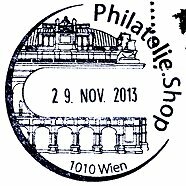 (New issue, promoting the WIPA08 philatelic exhibition. 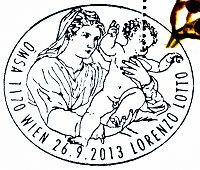 The overprinting and the date of issue corresponds to the annual philatelic exhibition in Gmunden). 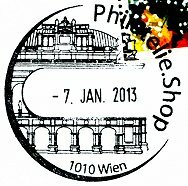 (New issue, promoting the WIPA08 philatelic exhibition, with the dates). (Commemorative issue on the occasion of the WIPA08 philatelic exhibition). And again, the rolls of labels with a seasonal theme, are used from November 21st 2008. As happens every year, with the arrival of the Christmas season, the rolls of labels with floral design are replaced, in the Sielaff distributors, by rolls with a seasonal theme. After 3 years of using the rolls manufactured in 2006, new designs by Hannes Margreiter - a composition of snow crystals and a scene of a traditional Christmas market, manufactured by the Deutsche Bundesdruckerei, are being used from 2009. This new series was available from November 20th 2009 to January 6th 2010. After more than 3 years using the same rolls of labels featuring the Tulips and Liverworts definitive designs, new rolls of labels with two new floral themes -marguerites and water lilies- were used in the Sielaff distributors, from January 2010. The new designs are also by Hannes Margreiter. The special Christmas edition 2010, also by Hannes Margreiter, is again formed from two designs, which appear consecutively on the rolls. One of the designs depicts a winter snow landscape, and the other is a Christmas scene with an angel, a Christmas tree and a snowman. This series was available from November 19th 2010 to January 6th 2011. As in 2010, two new designs, with floral themes, were released after the winter / Christmas issues. The new labels are designs by Hannes Margreiter and depict the gentiana and sunflower. The 4th special Christmas edition for 2011 is also designed by Hannes Margreiter. The two designs appear consecutively on the rolls, and feature a winter landscape and different Christmas gifts. 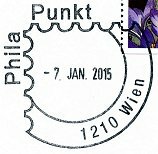 As with the previous issues, this series was used in the Sielaff distributors during the holidays season, from November 25th 2011 to January 6th 2012. The fourth series with floral themes was launched in the beginning of the year. The new designs by Johannes Margreiter depict the orchids and primroses. The rolls of gummed labels were manufactured by the Berlin company Bundesdruckerei GmbH. Fifth special Christmas set. Two new designs by Hannes Margreiter, featuring a winter landscape and a fir forest. This set was available from the Sielaff distributors during the holiday season, from November 30th 2012 to January 6th 2013. The fifth definitive series featuring floral themes, for use in the Sielaff vending machines in service, was released at the start of 2013. 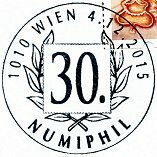 The Austrian philatelic service called this series 'Sommer 5' (Summer 5). The new designs are, again, by Hannes Margreiter and depict the wild rose and a bouquet of flowers. 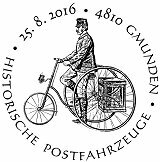 The rolls of gummed labels were manufactured by the Berlin company Bundesdruckerei GmbH. The sixth special series (Winter 6) for the Christmas season features a winter landscape and Christmas decorations with bells. The designs are by Hannes Margreiter and, as every year, they were only used in the Sielaff distributors for about 6 weeks, from November 29th 2013 to January 6th 2014. The sixth definitive series featuring floral themes, for use in the Sielaff vending machines in service, was released at the start of 2014. 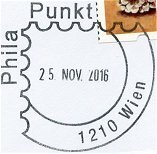 The Austrian philatelic service called this series 'Sommer 6' (Summer 6). The designs are by Hannes Margreiter and depict the garden cosmos and flax flowers. 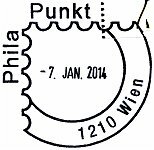 The rolls of gummed labels were manufactured by Bundesdruckerei GmbH. The seventh special series (Winter 7) for the Christmas season features a winter landscape and a small village under the snow. The designs are by Hannes Margreiter and, as every year, were only used in the Sielaff distributors during the Christmas season, from November 28th 2014 to January 6th 2015. The seventh definitive series, featuring floral themes, for use in the Sielaff vending machines in service throughout the year, was released at the start of 2015. 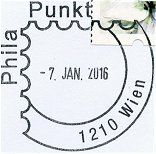 The Austrian philatelic service called this series 'Sommer 7' (Summer 7). The designs are by Hannes Margreiter and depict a daisy field and crocus flowers. The rolls of gummed labels were manufactured by Bundesdruckerei GmbH. In 2015, the 60th Eurovision Song Contest was held on May 19th, 21st and 23rd, in Vienna, following Austria’s victory in the 2014 show. 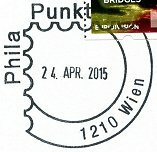 Österreichische Post dedicated a stamp (right) and two ATM designs for this event, all illustrated with the logo and slogan of the contest - 'Building bridges'. It is interesting to note that none of these issues includes the country's name. 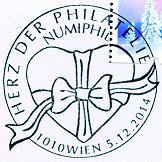 The Eurovision stamps were designed by ORF Marketing and Creation. The rolls of gummed labels were manufactured by Bundesdruckerei GmbH, and printed by offset. 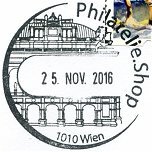 These designs were available from the different Sielaff postal kiosks only from April 24th until the end of the Contest on May 24th 2015. The eighth special series (Winter 8), for the Christmas season, features tables with gifts and 'Lebkuchen' or traditional Christmas cakes. The two designs are by Tristan Fischer. The rolls of gummed labels were manufactured by Joh. Enschede Stamps B.V., and printed by offset. 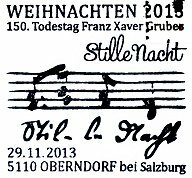 As every year, these designs were only used in the Sielaff distributors during the Christmas season, from November 27th 2015 to January 6th 2016. The eighth definitive series, featuring floral themes, for use in the Sielaff vending machines in service throughout the year. 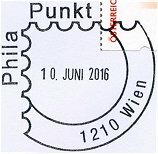 The Austrian philatelic service called this series 'Sommer 8' (Summer 8). The designs are by Tristan Fischer and the rolls of gummed labels were manufactured by Joh. 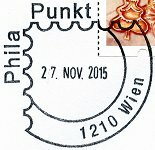 Enschedé Stamps B.V., printed by offset. 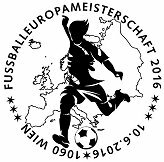 Special series of issues dedicated to 2016 UEFA European Championship or UEFA Euro 2016, held in France from June 10th to July 10th 2016. The two designs are by David Gruber and the rolls of labels were manufactured by Joh. 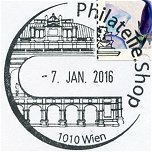 Enschedé Stamps B.V., printed by offset. The two designs of the ninth special series (Winter 9), for the Christmas season 2016, are by Tristan Fischer. The rolls of gummed labels were manufactured by Joh. 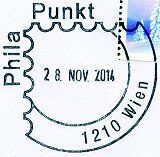 Enschedé Stamps B.V., and printed by offset. 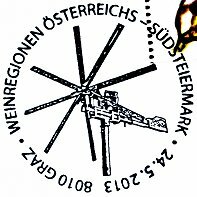 As every year, these designs were only used in the Sielaff distributors during the Christmas season.